Total weight gain: Hmm, perhaps I should have weighed myself on the scale at home the same day I was at the doctor last. Eh, let's assume I've probably gained no more than a pound this week. I'll try to remember to keep up with this after my next appointment. Movement: Now, it could be nothing or indigestion or gas or my internal organs rearranging themselves but when I was going to bed one day this week it seemed as if there might have been a bit of fluttering. Or not. We'll see how this week goes. Cravings: Nothing of note this week. There was one day when nothing sounded good for dinner so I splurged with Taco Bell. I just wanted some nachos. Don't judge. And I had a kid-sized root beer this week and it was mighty tasty. I don't know if I believe that eating healthy makes you not ever want those bad-for-you foods you were used to eating. Oh, wait! Peaches! Peaches have tasted exceptionally good this week. 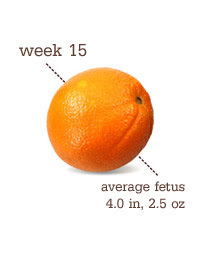 It had been killing me to NOT blog about the whole pregnancy thing. Since I started blogging, journaling has become nearly non-existent. A few months ago, I had to break out pen and paper again. So here are some excerpts to catch you up on things. May 16, 2010 ...I had my (thankfully) first positive UPT at about 3:00 this morning. I know, 3am. I really had to potty and was also a little anxious for the results. Hubby was up and I told him the results. He got up to go to the bathroom himself. A few seconds late he says, "I peed on it, too, and now it's saying we're not pregnant." I was very amused. So here we are. I'm feeling happy and only slightly freaked out. Ok, so I almost forgot to include a post about this. If you live in Texas, you know Aggies are a little crazy with tradition. Perhaps we're so crazy with tradition, you may know this even if you're a foreigner. One thing that I've really enjoyed at previous weddings of Aggie friends is that they pay tribute to our school. How do we do that? We all get up and sing. It's awesome. There were lots of Aggies there...too many for one picture. And even more who were there earlier in the evening but now have little ones and had to go home before our night was over. There's something about doing this that brings everyone together. There are people in this line who are currently attending school and folks who graduated long ago. But somehow (shh...it's the traditions), A&M brings all those people together. "There's a Spirit can ne'er be told..."
Total weight gain: At the last appointment (on Tuesday), I was up 7 lbs from the starting point. Movement: Nothing that I can feel yet but we did see movement on our last ultrasound (last Wednesday, 12 weeks + 4 days). Cravings: I've wanted lemonade. Good, fresh-squeezed lemonade. I think I've just been more thirsty in general though. Lord knows it couldn't be because it's about a million degrees outside. We interrupt baby crazies to continue on with wedding recaps. Only two more after this and I'll be done in time for our anniversary! 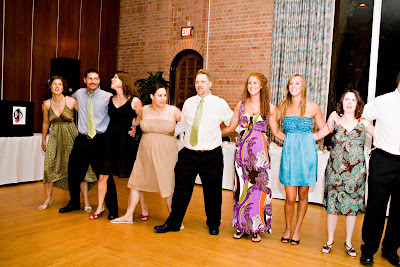 So, nothing can compare to the ladies' crazy bouquet toss reaction but the garter toss was pretty fun, too. My Hubby knew he wanted to make it a little more fun than normal so he had a little something up his sleeve. And in his pockets. I had told him I was ok with the now-traditional groom-going-up-the-bride's-dress thing. So he went up there and pulled out a few things before getting to the garter. And, finally, the real thing. Shockingly, the guys didn't get nearly as crazy as the ladies had. But at least they didn't just let it drop to the ground. Or, technically, just one cat. 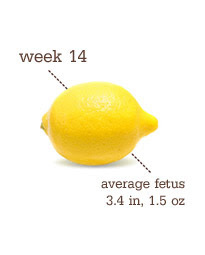 Thirteen weeks along. It's either a boy or a girl and I think I'll tell you which sometime in January. Much more to come but trying to dig myself out of post-vacation overwhelm. Oh, people. I'm tired. It has been a very busy summer with regards to work and, uh, just about everything else. I'll have more for you next week but for now I'll just show off my cute little homemade July 4th bunting (made totally for free with scraps I had lying around). Taken with my new DSLR camera. See? That's how busy I've been. I haven't even excitedly posted about FINALLY making that purchase. Or about the 4th of July party. Or making jam. Or going to see "Wicked." Heading to Minnesota tomorrow with my MIL and SIL. I'm not sure what all we will be doing but I'm hoping for a nap or two. These are some of my favorite pictures from the whole day. You'll see why in a second. 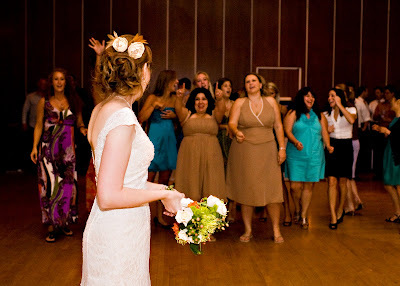 Ah, the bouquet toss. In the modern day wedding community a lot of folks are doing away with this. I don't know...as I got older and was still single I think I started hating the tradition. Or, rather, I hated that I didn't really feel like being the only single adult woman surrounded by 8-year-olds. And the harassment you get from people if you don't go out there and try to catch that bouquet. They know it doesn't come with a groom attached, right? But I didn't mind the idea at my own wedding. And I have a feeling some of my ladies would have been really pissed if I hadn't done it. So we stuck with tradition. Sort of.